The Palawan live in the south of Palawan Island in the Philippines. 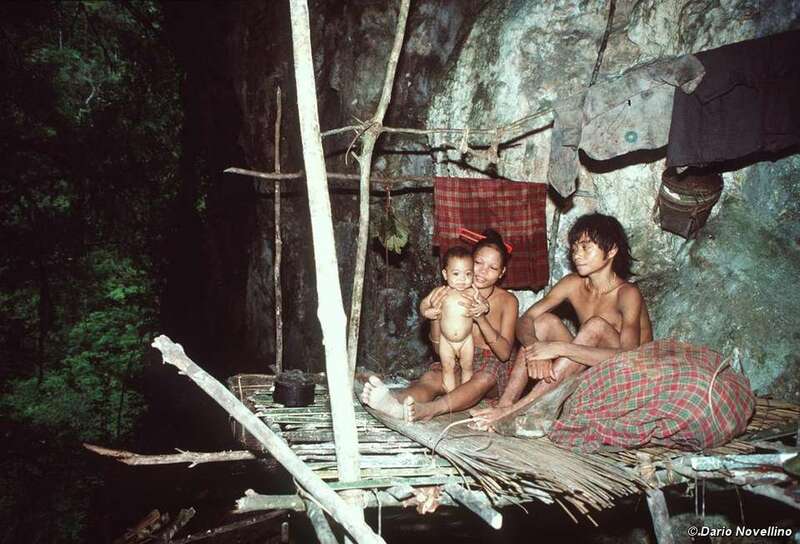 Thousands of new settlers and a big mining push by the Philippine government now pose a serious threat to the tribe. 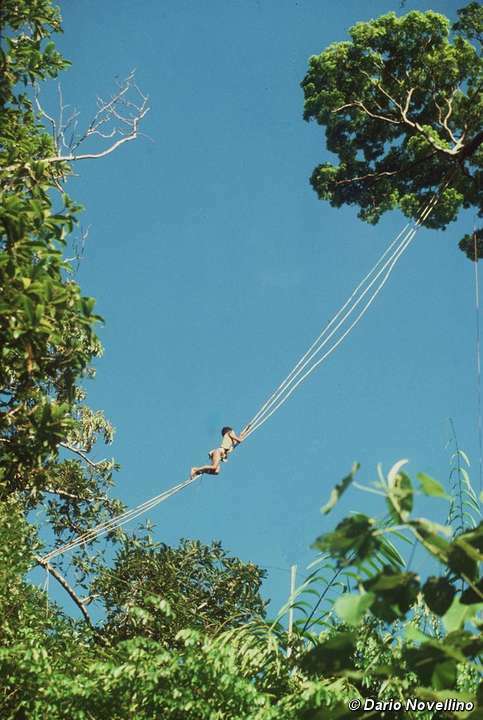 A Palawan climbing an aerial bridge made of rattan canes to reach a ginuqu tree canopy. The Palawan live in the south of Palawan Island in the Philippines, both in the mountainous interior and in the lowlands. There are around 40,000 Palawan in total. 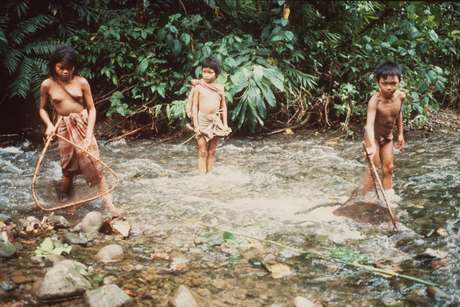 Some of those in the interior are very isolated and have little contact with outsiders. The Palawan are shifting cultivators, clearing a small area of forest and growing food on it before moving on and allowing the forest to regenerate. They grow upland rice, which they believe has a ‘human-like personality’. They also collect honey and hunt wild pigs. In 2000, a road was built around the island, attracting thousands of new settlers from other parts of the Philippines and forcing many Palawan further inland. In 2006 there was a big mining push by the Philippine government. The President called for a revitalization of mining across the nation. This now poses an even more serious threat to the Palawan communities. Hundreds of mining applications have been made by companies seeking nickel and chromite, as well as other resources, on indigenous peoples’ land on the island, including the areas where isolated Palawan live. 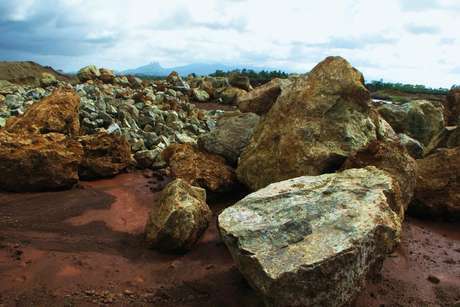 In 2008, a 25-year moratorium on small-scale mining in Palawan was passed. However, large-scale exploration and extraction are set to continue, especially in areas inhabited by the vulnerable and isolated Palawan communities. 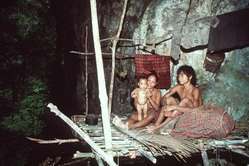 A family of Tau’t Batu (People of the Cave) at the entrance of Pangi-Pangi cave, in Singnapan Valley. Open pit and strip mining would devastate the mountains and forests, pollute the rivers and the sea, and destroy the Palawan’s burial sites, important landmarks and spiritual places. Survival is campaigning with local organizations to stop mining on the Palawan’s land without their genuine full and informed consent. We are also urging the Philippine government to officially recognize and protect their territory, in accordance with Philippine law. The Palawan grow most of their food on small plots of land in the forest. Before clearing an area for planting, they consult and appease various spirits and interpret omens in their dreams. Wild pig is the Palawan’s favourite meat, and they must make a request to the pig animal ‘master’ before catching it. Bees are also believed to have their own master, who can only be seen by the beljan (shaman) during trance. Some communities perform a ceremony every seven years to ‘cleanse the world’ and restore the cosmic balance. The Palawan collect and sell resin, rattan canes and wild honey. The more settled of the Palawan also grow rice and coconut to sell, and raise domestic animals such as cows, buffalos and pigs. Mining has already made it difficult for some Palawan communities to grow and hunt enough food. 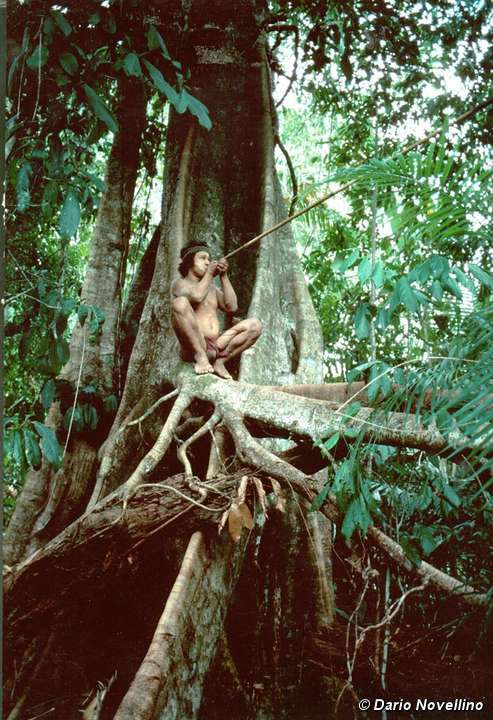 Parts of their forests have been devastated, their rivers have silted up and their sacred sites have been destroyed. The huge nickel mining projects will destroy miles of forest, depriving the most vulnerable Palawan of their livelihoods. Mining in Palawan has already ravaged forests, generated flooding and caused the siltation of rivers and farmland. It has also destroyed sacred sites. The impact of nickel mining in the concession of Rio Tuba Nickel Mining Corporation (RTNMC). The company MacroAsia, owned by billionaire Lucio Tan, plans to mine the ancestral land of the isolated Palawan living around Mt. Gantong and the Mantalingahan range. These communities are particularly vulnerable and will not survive the loss of their land. London-based Toledo Mining Corporation holds a significant stake in a Nickel Laterite operation which is also threatening the Palawan’s land. Another company, the Rio Tuba Nickel Mining Corporation, is planning to mine in the Bulanjao Range at the southern tip of the island – an area of rich forest which provides vital water sources for both indigenous communities and migrants. The company’s road is already causing serious environmental damage such as landslides, soil erosion and deforestation of the watersheds. Under a provincial government initiative, many thousands of hectares of oil palm and other agro-fuels have been planted in Palawan. This is having a devastating impact on the biodiversity of the region and is limiting people’s access to customary natural resources. The Palawan have not been properly consulted about either the mining projects or the oil palm plantations. The Philippine government is also failing to implement the country’s Indigenous People’s Rights Act (IPRA), which provides for the identification, delineation and recognition of indigenous land. The mining projects on Palawan Island clearly violate this and other Philippine laws. Watch Voices from the ‘Last Frontier’ a documentary on the situation. Read more about the mining threats to isolated Palawan communities in Bulanjao and and Gantong/Brooke’s Point in these two geo-tagged reports of a joint investigation by Ancestral Land/Domain Watch (ALDAW) and The Centre for Biocultural Diversity (CBCD) of the University of Kent (UK). 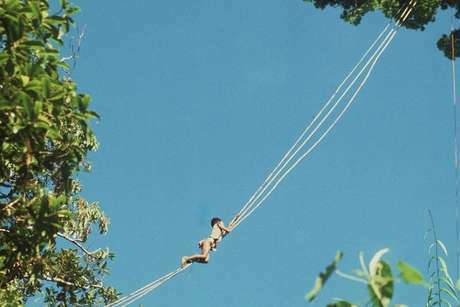 The principle on which the Palawan base their life is called ingasiq, meaning ‘compassion’. This underlies all their actions and emphasizes the importance of behaving with generosity and sympathy towards others. Their ceremonies, prayers, chanting and healing dances are all part of what they call adat et kegurangurangan, or ‘the customs of the ancestors’. For the Palawan, the universe is vertical and divided into fourteen different layers. The souls of the beljan (shamans) are able to travel to these other levels in order to ‘heal the world’ and to re-establish the cosmic balance. Shamans are not seen as special or sacred people, but are those who, either in a trance or dream, are able to enter the invisible world and contact super-human beings. They can see and extract impurities that are causing sickness from a patient’s body. They are also usually experts in the use of medicinal plants. Good health is dependent on a balance between the body and its ‘life force’ (kuruduwa). The loss of kuruduwa creates a disturbance, which makes the body vulnerable to illness and attacks by malevolent beings. The supreme being for the Palawan is known as Empuq, (the Lord or Owner) and he is believed to be the creator of all things in the world. Other benevolent beings live in the higher mountains. 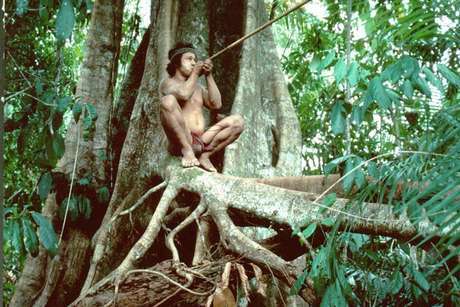 The Palawan believe that the forest is home to a large number of demons. Demons known as lenggam are believed to be the caretakers of poisonous and biting animals such as scorpions and snakes. Over-hunting or harvesting certain trees can cause these creatures to attack humans. Write a letter to the government Department of Environment and Natural Resources to express your concern. Donate to the Palawan campaign (and other Survival campaigns). If you have time, please also write to these other addresses (pdf document). Document also contains a more detailed letter for those who have already written and would like to write again.